As we discussed in the previous section, well articulated learning objectives are a foundation for any blended learning design process because they establish what you want your students to know or do upon completion of your course. As we look to further explore the learning objectives, it is worth considering an objectives significance from various perspectives. Well crafted learning objectives allow all stakeholders in the course to share a common understanding of what the course is about. For instructors and course designers, the value of a learning objective is perhaps most obvious. In short, learning objectives enable the blended learning design process to happen. Learning objectives provide road map for a course and help align content, assessments and activities to round out the learning experience. Well developed learning objectives can also help students to understand better their own learning process. When the goals are explicit, students can more purposefully approach readings, activities, and assignments and more easily make connections that deepen the learning experience. Furthermore, students may be able to articulate skills more clearly and link their learning experiences to a real-world context. Though our primary focus remains at the course level, learning objectives can have significance beyond the course level. In thinking about how your course objectives take shape, it may be worth considering how programs, departments, and institutions might use learning objectives to help organize more holistic learning pathways for students. For example, our institution has the UW Essential Learning Outcomes help communicate to prospective students how a UW education will prepare them for life after graduation. At the same time, this communicates to prospective employers what skills and abilities a UW graduate will bring to an organization. Departments and programs can also outline learning objectives that align with those institutional objectives but speak more specifically to how a program of study will prepare a student for a specific discipline. Learning objectives might seem straightforward, but there are actually quite a number of considerations to make to ensure that an objective is complete and works to align with the various elements of a blended course. 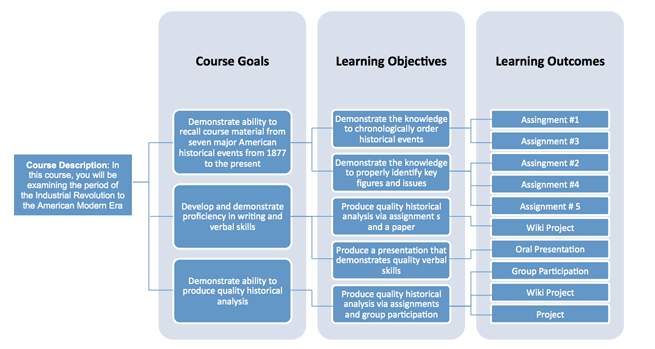 The diagram below outlines how objectives work at various levels of a course to build a the course structure and to help define the various assignments, activities, and assessments. While each characteristic above is an important component of a complete learning objective, it is worth spending a moment looking at the way in which the verb can link an objective to one of the six cognitive domains within Bloom’s Taxonomy. Now that we’ve established the component parts of a well-written objective, let’s look review a few examples. Consider the table below and note the difference between the strong and weak objectives. As you review the chart, notice how the strong objectives include each of the essential components of an objective (listed above). At the same time, note how the weak objectives contain a non-descript verb and imprecise object. Understand how to measure the association between a given risk factor and a disease Define and calculate measures of association between a given risk factor and a disease. A Model of Learning Objectives – Interactive tool based on A Taxonomy for Learning, Teaching, and Assessing: A Revision of Bloom’s Taxonomy of Educational Objectives by Rex Heer, Center for Excellence in Learning and Teaching, Iowa State University. Does your program or department have well defined learning objectives or outcomes for students? If so, how do those objectives impact your course design, activities, and assessments? If you have learning objectives developed for your course, are they written in a way that is measurable and actionable?